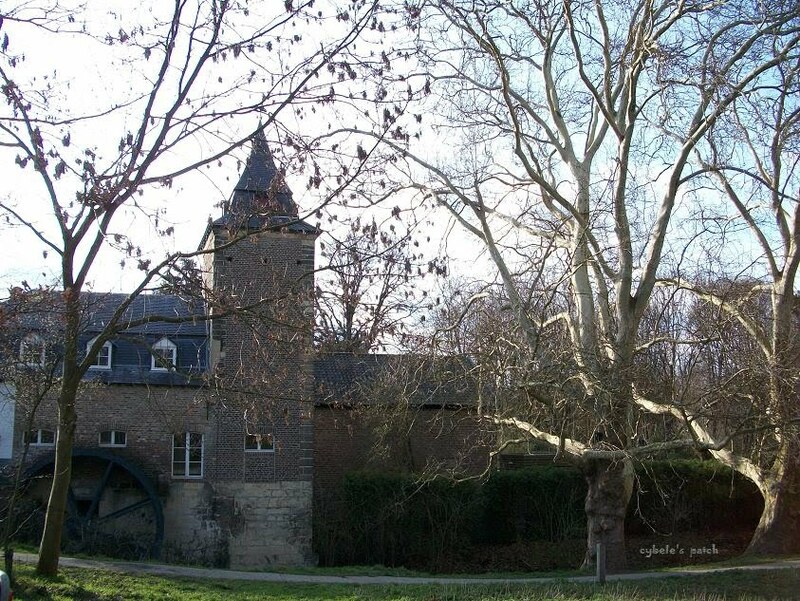 Today's picture shows a historical water mill, called the Weltermolen (molen = Dutch for mill). The mill was first mentioned in the 14th century. It is not known when exactly the mill was build. I suppose the first water wheel must have been made of wood. The ownership of the mill changed many times caused by deaths or divorces. It is now privately owned. The mill is fed by the pond mentioned in my last post while the pond is fed by a stream: de Geleenbeek. 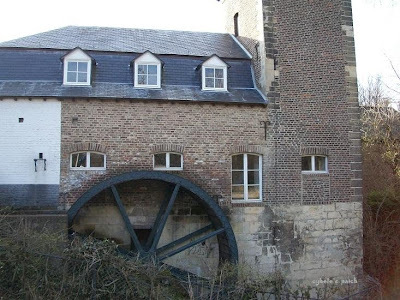 The water wheel was replaced by a new iron wheel at the end of the 19th century. During WW2 the mill was taken out of action and fell into decay. Because of the historical value of the mill it has been restored around 1980. On a few milling days the mill works and is open to visitors. This picture gives you an idea of the size. The diameter of the wheel is over 5 meters. For more interesting My World pictures clich here. Incredible old building! The tower element almost looks like part of a castle! What an interesting and appealing water mill. Great choice from your world. mills are such interesting places to visit and see how they operate, i wonder if this one still works, it is a beautiful building. Beautiful historic building. The wheel is really huge. And it still works, marvelous, must be incredible to see it all working, noisy too I imagine. This thing still works or it works for tourist reasons? Great photos and beautiful place. Erg leuk, om zo mijn eigen omgeving te zien! I love your header! Great photo. And thanks for sharing the mill, I shared a mill myself today, I wasn't big on the explaining part though, unlike you. Awesome! Mooi die watermolen. Fijn als al het oude bewaard blijft. Je vroeg waarom de lammetjes op mijn blog rode stukken op hun rug hebben. Ze lopen vrij dicht langs de weg dus ik denk dat dat een merkteken is. Het is een soort rode verf die ze er op zetten om te laten zien wie de eigenaar is. What a beautiful world you have! And great photos to share with us! Beautiful old building.Thanks for sharing beautiful pictures and information about it. lovely buidings, people call me jossie too (jocelyn), so hello twin, from london.